Frank Bunker Gilbreth (July 7, 1868 – June 14, 1924) was an American engineer, early advocate of scientific management and a pioneer of time and motion studies. Lillian Evelyn Moller Gilbreth (May 24, 1878 – January 2, 1972) was one of the first working female engineers holding a Ph.D. A pioneer in ergonomics, she patented many kitchen appliances that made work in the kitchen easier. The Gilbreths are considered the founders of modern industrial management, who sought to improve workers’ productivity while making their work easier. They were, above all, scientists who sought to teach managers that all aspects of the workplace should be constantly questioned, and improvements constantly adopted. In this way, their work advanced appreciation for the importance of the addressing the needs of workers, and through taking care of those individuals the whole purpose would be better served. Frank Gilbreth was born on July 7, 1868, in Fairfield, Maine, to John and Martha Bunker Gilbreth. His family had lived in New England for generations, and his father ran a local hardware business. After the death of his father in 1871, Frank's mother took her family first to Andover, Massachusetts, and then to Boston, in order to provide the best education for her children. Frank eventually graduated from English High School in Boston in 1885, and had passed an entrance exam to the Massachusetts Institute of Technology, but decided not to go to college. Gilbreth started his career as a bricklayer’s apprentice. He learned about the job by watching the movements of senior workers. It was there that he first tried to find “the one best way” to complete a task. He quickly progressed in his job, becoming a foreman and eventually a superintendent. In 1895, Gilbreth started his own contracting company. The motto of the company was "Speed Work," with the goal to eliminate all waste time and reduce costs. As bricks were gradually being replaced by the use of concrete, Gilbreth patented numerous innovations that helped his company’s business. For example, he invented a concrete mixer that sped up the process of making concrete. His firm was gradually able to significantly reduce the time for finishing its projects, becoming famous across the States. Its projects included dams, canals, factory buildings, and the entire town of Woodland, Maine. Gilbreth eventually expanded his business to England. On October 19, 1904, Frank Gilbreth married Lillian Moller. Lillian Evelyn Moller was born on May 24, 1878, in Oakland, California, the oldest of nine children of William and Annie Delger Moller. After graduating from high school, she attended the University of California, Berkeley, graduating with a B.A. (1900) and M.A. (1902). Moller was the first woman in the university's history to give a commencement speech at her graduation, in 1900. Her major was in modern languages and philosophy, and her goal was to teach English. Moller completed her dissertation to obtain her Ph.D. from the University of California but did not receive the degree because she was not able to complete the residency requirements. Moller married Frank Gilbreth in 1904. The couple had 12 children. The Gilbreths applied their management techniques in running their large household. They created a Family Council, with a purchasing committee, a budget secretary, and a utility committee. Two of their children later wrote humorous accounts of their family life, Cheaper by the Dozen and Belles on Their Toes. Under Lillian’s persuasion, Frank Gilbreth changed his career from construction to management. In 1908, Frank published his first book, Field System. After their marriage, Lillian Gilbreth had to handle several major responsibilities—her studies, her family, and their family business. She worked as a systems manager in her husband's consulting business and had helped her husband in his projects. In 1910, the Gilbreths moved to Providence, Rhode Island, and Lillian Gilbreth decided to enter Brown University to complete her doctoral studies in psychology. She earned her Ph.D. in 1915, her dissertation entitled, The Psychology of Management. It was the first degree granted in industrial psychology. The Gilbreths started to apply their expertise—Lillian in psychology, and Frank in the expedience of motion—to find the link between psychology and management. The couple wrote numerous books and articles. In 1913, the Gilbreths started the Summer School of Scientific Management, where they taught their method. The school was attended by academic and industry professionals from around the world. In 1914, Frank Gilbreth went to Germany to visit industrial plants and establish new laboratories. He also spent time in teaching and consulting. At the beginning of World War I, as the wounded soldiers started to arrive in the hospitals, Gilbreth helped improve surgical procedures and introduced motion-picture photography for the education of surgeons. He eventually became an expert in rehabilitation of the injured. When the United States entered the war, Gilbreth enlisted and joined the Engineers Officers Reserve Corps. However, he developed heart problems and his family moved to Nantucket, Massachusetts, to facilitate his recovery. On Gilbreth’s proposal, the first international management congress in history was held in Prague, in 1924. Frank Gilbreth died suddenly of heart failure on June 14, 1924, at age 55, in Montclair, New Jersey. After her husband’s death, Lillian Gilbreth moved her family to California, and continued their family business. Numerous famous firms, such as Macy’s, Johnson & Johnson, Sears, and Dennison Co. hired her consulting company to train their employees. She also started a new school called Gilbreth Research Associates but closed it several years later. She received 22 honorary degrees from schools such as Princeton University, Brown University, and the University of Michigan. She served as visiting professor at Stanford, Harvard, Yale, and the Massachusetts Institute of Technology. In 1935, she joined the Purdue University faculty as a professor of management, becoming the first woman professor in the engineering school. During World War II, she worked as a consultant at the Arma Plant in Brooklyn, New York, which handled Navy contracts. In 1948, she started teaching at the Newark College of Engineering in New Jersey. She also taught in Formosa from 1953 to 1954, and at the University of Wisconsin in 1955. She received the Hoover Medal from the American Society of Civil Engineers in 1966, and was awarded the Gantt Gold Medal from the American Society of Mechanical Engineers and the American Management Association. She was a Fellow of the American Psychological Association. Lillian Gilbreth died in Phoenix, Arizona, on January 2, 1972. The Gilbreths were pioneers in the field of industrial engineering. Frank Gilbreth discovered his vocation when, as a young building contractor, he sought ways to make bricklaying faster and easier. This grew into collaboration with his eventual spouse, Lillian Moller, who studied the work habits of manufacturing and clerical employees in all sorts of industries to find ways to increase output and make their jobs easier. He and Lillian founded a management consulting firm, Gilbreth, Inc., focusing on such endeavors. Their Summer School of Scientific Management trained professionals to implement new ideas about management. They were concerned with the mental and physical health of the workers. Through analyzing complex machinery they invented new tools and methods to simplify their use. Their work led to a better understanding of the importance of the well-being of the individual in a business setting. The Gilbreths were able to reduce all motions of the hand into some combination of 17 basic motions. These included grasp, transport loaded, and hold. Frank Gilbreth named the motions therbligs, "Gilbreth" spelled backwards with the th transposed. He used a motion picture camera that was calibrated in fractions of minutes to time the smallest of motions of the workers. During World War I, Frank Gilbreth worked to improve treatment of injured soldiers. He first observed the motions of the injured soldiers, and then taught them new methods to manage their daily activities. Frank Gilbreth also helped improve surgical procedures in hospitals. He was the first to propose that a surgical nurse serve as "caddy" (Gilbreth's term) to a surgeon, by handing surgical instruments to the surgeon as called for. Gilbreth also devised the standard techniques used by armies around the world to teach recruits how to rapidly disassemble and reassemble their weapons even when blindfolded or in total darkness. These innovations have arguably helped save millions of lives. After the death of her husband, Lillian Gilbreth turned her attention toward household work and increasing the efficiency of kitchen appliances. Working for General Electric, she interviewed over 4,000 women and collected data on simple household chores, such as collecting garbage or washing dishes. She then used the data to design the proper height for sinks, stoves, and other kitchen appliances. She patented numerous appliances that made work in the kitchen easier. In her two works, The Homemaker and Her Job (1927) and Living with Our Children (1928), she wrote that home needs to be happy place to live, where everyone would achieve fulfillment. Since wives and mothers needed to be effective managers of their homes, Gilbreth tried to find optimal combinations of items in a typical home to make their lives easier. Although the Gilbreths' work is often associated with that of Frederick Winslow Taylor, there was a substantial philosophical difference between the Gilbreths and Taylor. The symbol of Taylorism was the stopwatch, and Taylorism was primarily concerned with reducing the time of processes. The Gilbreths, however, sought to make processes more efficient by reducing the motions involved. They saw their approach as more concerned with workers' welfare than Taylorism, in which workers were often perceived primarily in relation to profit. This led to a personal rift between Taylor and the Gilbreths, which after Taylor's death turned into a feud between the followers of the Gilbreths and of Taylor. After Frank's death, Lillian Gilbreth took steps to heal the rift, although some friction remained over questions of history and intellectual property. The Gilbreths were, above all, scientists who sought to teach managers that all aspects of the workplace should be constantly questioned, and improvements constantly adopted. Their emphasis on the "one best way" and the therbligs predates the development of continuous quality improvement (CQI) (George 1968: 98), and the late twentieth century understanding that repeated motions can lead to workers experiencing repetitive motion injuries. Although the Gilbreths and Frederick Winslow Taylor worked independently, their approaches to improving efficiency logically complemented each other, with the Gilbreths' focus on motion and Taylor's on time, as time and motion are two sides of the efficiency improvement coin. Indeed, the two fields eventually became time and motion study. Lillian Gilbreth is considered "The First Lady of Engineering" and was the first woman elected into the National Academy of Engineering. She was among the first theorists of industrial management to emphasize the importance of psychological variables in management. In 1984, the United States Postal Service issued a postage stamp in her honor. She and husband Frank have a permanent exhibit in The Smithsonian National Museum of American History and her portrait hangs in the National Portrait Gallery. Frank and Lillian Gilbreth often used their large family as a sort of an experiment. Their family exploits are lovingly detailed in the 1948 book, Cheaper by the Dozen, written by son Frank Jr. and daughter Ernestine. The book inspired two films of the same name. Gilbreth, Lillian M. 1927. The Home-maker and her Job. New York, NY: D. Appleton and Co.
Gilbreth, Lillian M. 1928. Living with our Children. New York, NY: W.W. Norton & Co.
Perkins, James S. 1997. "Frank B. Gilbreth’s Research: The Quest of the One Best Way" in Newsletter of the Gilbreth Network. Vol. 1, No. 2. Retrieved November 28, 2007. Sullivan, Sherry. 1995. "Management's Unsung Theorist: An Examination of the Works of Lillian M. Gilbreth." In Biography. 18, 31-41. All links retrieved April 26, 2017. Frank Gilbreth Encyclopedia of World Biography. The Gilbreth Network – On Gilbreth’s work. 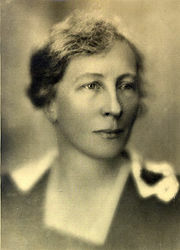 Lillian Moller Gilbreth in National Women’s Hall of Fame. History of "Frank and Lillian Gilbreth"
This page was last modified on 26 April 2017, at 15:35.